will Win the game situation! The Best Online Mental Agility Skills for Hockey Players Today! The Mental Agility is as important as the physical condition and technical skills. If you don’t master Mental Agility, the physical and technical skills will not be in place. No matter how physically gifted the player is, he or she will not succeed at “real deal hockey” if their Mental Agility does not match their physical and technical condition. There is a distance and time from brain to muscles and this fact is usually neglected by coaches and players. The question is how Mental Agility can be taught? Mental Agility training should be treated as cognitive training and not physical or technical. Today, there is a need for a change of direction in individual player’s development. My online cognitive training helps accurately and quickly to anticipate your opponents in fraction of a split second. Also, Online Mental Agility Skills challenged players cognitively and encouraged them to go farther than they’ve ever gone before. Ask Wayne Gretzky if I am wrong! Is Your Brain preparing for upcoming Game? How fast is your Brain in the Game? Hockey is spontaneous situational game. Most real-deal play situations have deficit of time (3-4 seconds) and information. Hockey players must make proper decisions and effectively perform mental skills within that time. Situational thinking becomes the most important hockey skill. 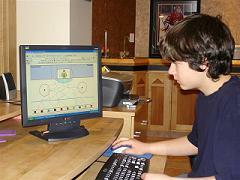 Since Hockey is 99% mental thinking, the best preparation for the next game is my online individual cognitive training. Many of my hockey players from Canada, US and Sweden successfully maximize their chances by online home training, hour before upcoming game. Train Your Brain for upcoming Game! Try it and you will see the Difference. The faster the mind works, the slower the game appears. Online intellectual sport training offers a deepening experience of Visual-Mental Agility that has immediate impact on quick thinking, fast reaction and proper movement in the on ice game. What Scientists and High-Level Coaches Say on the Subject! It is mind speed that controls the body during high-speed activity. Most hockey players and coaches spend enormous amounts of time and energy trying to improve technical and physical skills but neglect tactical mental development. However, game thinking or mind agility is still the most important fundamental player skill. With a high-speed decision making abilities, the game speed can actually appear to slow down and give the player that extra moment to relax and play faster and more accurately. "The best of the best are those who possess the mind speed to complete one action while thinking of the next, and maybe even the one after that." In other words, there aren't fast effective legs without fast mind speed. The Difference Between Who is First or Second is one Golden Split Second! The speed of the mind isn't speed that we can see or time with a stop watch. It is measured in milliseconds, and can't be seen when watching body motion. Brain speed is what goes on it the players mind before he reacts. Put simply, mind speed is the essence of a "future Gretzky" and the a "Miracle on Ice". by upgrading your "Visual Skill". Many hockey players with good physical abilities get tired quickly at the game. Most of them believe that they need to focus more and more on their strength conditioning. This is, in my view, a big mistake! The fact is, they wear out from Visual - Thinking tiredness, exhaustion and fatigue and not from lack of general body shape or endurance. In short, if the muscles of Visual - Thinking System get tired, then muscular system of whole Body gets tired too. In any sport including hockey are two types of endurance: general and specific. General endurance can be developed by aerobic body fitness training. Specific endurance relates only to hockey techniques, where all offensive and defensive skills are performed at top speed in every shift and incorporated with Vision and Thinking Agility. A hockey player with a significant level of Visual Thinking Agility can demonstrate stable individual hockey technique for a longer time, not only in a single game but in the whole hockey season. "TRACK THE PUCK"AND "DYNAMIC VISION"
Discover how to control emotional intelligence and develop mental toughness with the help of those on-line training programs! These programs are designed to improve your ability in Speed Reading, Quick Thinking, Peripheral Vision and Seeing Quick Actions Slower through the use of a personal computer at home. I am convinced that Mental Agility Development must become an important part of overall athletic training. If visual thinking systems are not working correctly and automatically, then the body's physical system will be negatively effected. Computerized "Track the Puck"and "Dynamic Vision" were tested on our students in Canada, USA, Czech Republic and Sweden. Every time it has been proven effective. Click here for member feedback on "Track the Puck". This program conducts ten basic vision thinking and hand motion exercises with three levels of complexity: A, AA, AAA. Only when the "reading-thinking" skills become quick and accurate enough on level A will the computer let you progress to the next level. "TRACK THE PUCK" creates an environment which challenges mind qualities like reading, recognition, intuition, emotion control, and finding solutions. Online exercises include thousands of decisions for Eye-Mind-Hand connection and coordination. The programs develops the mind speed solving skills to be a step ahead of the action. Also, "TRACK THE PUCK" rewards top speed reading, quick anticipation and high-level accuracy. Click here for member feedback on "Dynamic Vision". 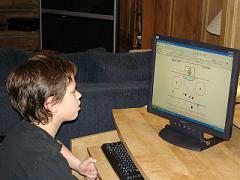 "Dynamic Vision" is the second online visual training test for hockey players. This program is the next advanced step from the ORIGINAL online training test "Track the Puck". Here, all pucks are moving in different directions with different timing to different locations. "Dynamic Vision" is an important part of Spatial Vision development for the Early Recognition of the Space-Time Dynamic Objects Interaction. It will give you the ability to recognize Human Motion instantly and react immediately. You have to remember, that any part of the Body-Skates-Stick-Puck System has three space-time dynamics: at the starting point of action, at the mid point and at the end point. The hockey "stars" are those who recognize the direction at the starting motion point (or no later than the middle) and react ahead of their opponent's motion. This program consists of sixteen speed recognition and eye-hand coordination shifts with three levels of complexity: A, AA and AAA. At each progressive level the quantity and speed of the moving pucks will be increased and their dimensions will be decreased for increasing challenge to your eye-hand coordination control. Only when the speed recognition skills become fast and accurate enough at Level A, will the computer program let you proceed to the next level. "Dynamic Vision" creates an environment which challenges your visual system qualities hierarchy: Visual Acuity, Eye Movements, Eye Recognition, Eye Tracking, Visual Awareness and Eye-Hand Coordination. As evidence shows, our online students must do visual exercises regularly to gain the most benefit. These are not just computer games to be played whenever the player-student feels like it. To make real and enduring progress, one should train consistently, something each student must accomplish on his own. I am proud to say that I've been successful at designing a System of Mental and Body Agility for on and now off ice training for hockey players of all ages and levels. THIS IS YOUR OPPORTUNITY NOW TO TAKE THE NEXT STEP TOWARDS HOCKEY MASTERY. "Track the Puck" and "Dynamic Vision" online exercises are universally applicable for tennis, baseball, basketball, soccer, lacrosse and boxing skills. Furthermore this electronic playground is showing benefits even for general reading, writing and comprehension at school. Take my new computer Visual Training Programs and find out if you have sharp reading-thinking skills and perfect seeing-observing aptitude! If you are interested enough to invest in computer training time, which you can use at home from my web site, please email me (ysmush2560@rogers.com) and I'll be very happy to assist you. Sigh up for access to our online training as a member now! Members: Play "Track the Puck" and "Dynamic Vision"